The PMS Monday Challenge today is to make some kind of Easter basket. 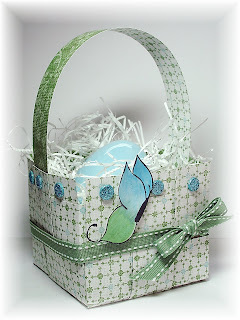 If you go to the blog, you can see some of the great baskets the DT team has made. I used Lauren Meader's basket template for this (found at PTI) and SU's retired Afternoon Tea dp. I just cut the paper to 8.5" x 11" and printed the template on the back side of the dp. After cutting it out, I assembled it according to the instructions. I used the butterfly from the PMS set Buggy Sayings. I used a technique Marianne Walker taught us in her copic certification class. I believe it's called feathering (I don't have my notes with me to make sure that's the technique!). You use two colors for this technique, one on the top and another on the bottom. Your marker is layed down darker at the beginning of the stroke and it sort of feathers out at the end. The lighter colors meet in the middle. I then took the blender marker and blended them together where they meet so it really looks like one color blends seamlessly into the other. After I did this, I added Sky Blue and Celery Shimmerz paint for the shine effect! Wild Wasabi stiched ribbon was tied around the basket, and I added turquoise glitter dots around the perimeter of the opening. I had some white grass filler to add to the inside of the basket and a cute ceramic robin's egg that I made eons ago when I was into ceramics! (Wow, that's a blast from the past!) It was perfect for this project. I used the reverse side of the dp for the handle. I planned on using an edge punch for a more decorative handle, but I attached the handle before I remembered to do it! Does this happen to you or is it just something that only happens to me? Make sure you hop on over to the PMS blog to see what the others have done, and we'd love to see your creations as well! Thanks for stopping by! Well, I have two for you and you won't be disappointed! I hope you like them! This Cross has got to be one of the prettiest crosses I've seen yet! There's a lot of intricate detail on it, but not so much that you'll go crazy coloring! For some reason, this card reminds me of a cake! I used to make cakes for all occasions, and this reminds me of a First Communion cake I made once! I had a cross pan and decorated it in these colors! Anyway, I digress...back to the card! It's colored with copic markers, and highlighted with a white gel pen. These highlight marks are right on the image, so it's a no-brainer to figure out where they should go (something I have difficulty with for some reason). After coloring it, I added some Platinum stickles to it, cut it out, and mounted it on a piece of Almost Amethyst which was cut and embossed with the curved rectangle nestie. The dp behind it is SU's retired Uptown dp. I just love this dp and wish I had more! This diagonal stripe sort of reminded me of rays of sun shining down. I also used the largest nestie in the pack to cut and emboss my Whisper White base. I didn't have flowers in colors to match, so I pulled out various sizes of flowers in white and colored them with a copic marker to match! Love that! The gold brads were also hit with some Platinum stickles for more shine and I added more sparkled to the flowers with a Sakura Clear Star gelly roll pen. The sentiment is one of five in the Believe Scripture set and was punched with an oval punch. I wish the camera would have picked up all the sparkle on this card because it is quite lovely! Isn't this guy just the happiest turtle you've ever seen? I fell in love with this Dawdling Turtle the moment I saw him! I used some new techniques I learned at my Copic Certification Class I attended last week. The shell was colored and shaded and then I took my copic blender marker and held the tip down on the color to "push" it out of the way so make these spots on the shell. (I was going to do a tutorial of this technique, but Beate already had one done which you can see here.) I also created the ground by just dotting my marker along the way to create a pebble effect. The blades of grass were made with a green Spica pen (I just had to get some shine in there somewhere! ), and the sky was created by using a soft brush and Pacific Point ink while the image was still in the nestie. I also used the clear Spica pen on the spots on the shell. Again, the camera doesn't do it justice! The sentiment comes with the stamp. 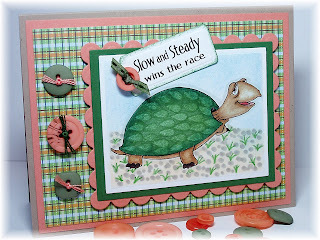 ("Slow and Steady Wins the Race" is a reminder of the story of the turtle and the hare.) 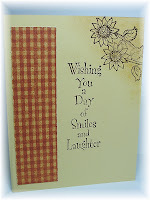 It was cut and embossed with the Spellbinder tag dies. The coral buttons are from PTI and the green from SU. I threaded floss through the ones on the side and ribbon through the button on the sentiment. This button was like a slide with wider openings for the ribbon to slip through. 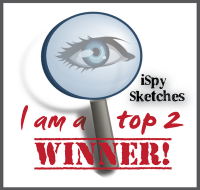 I also used Christi's sketch for the card, but deviated from it a bit in regards to the placement of the sentiment. 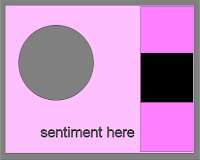 The image in the sketch was square, but my image was rectangular, and my sentiment wouldn't fit! I don't think anyone will mind, do you? LOL! Well, I hope you stop by Paper Makeup Stamps today or tomorrow because these and the other new releases are on sale until tomorrow, March 30! Just click on the April preorders to view all of them. There are some wonderful stamps there for as little as $1.80! I forgot to add one more thing! My best friend Maria and I went to our jeweler yesterday to purchase a Pandora bracelet for our friend's birthday. While I was there, I saw a turtle charm. I asked to see it and Maria asked "Why?" I told her it was to commemorate my first stamp I received as a DT for Paper Makeup Stamps. Here's a picture of it on my bracelet! He's right in the center! Thanks for stopping by! It's Wednesday and it's time for another Copic Colour Challenge! 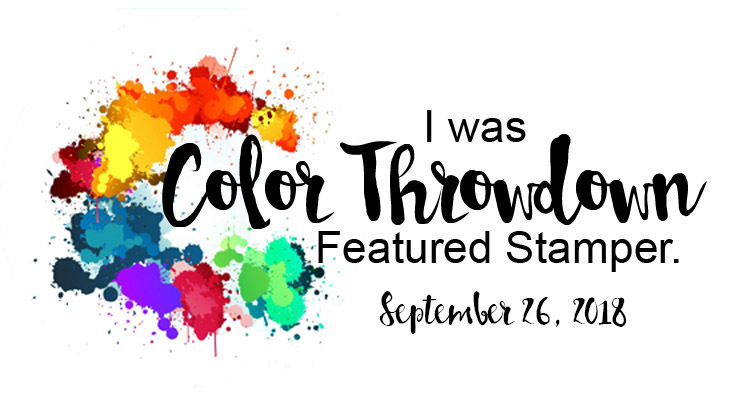 Did you see the colors? RV04 Shock Pink, R20 Blush, and E31 Brick Beige. Well, I immediately thought of an ice cream cone! I'm always thinking of sweets! LOL! Well, this is my interpretation of the colors. Not much coloring going on, but I think I used eight different colors on this little image (you can see all the colors I used in the Recipe below). The image and sentiment are both by Amuse, and I actually had to buy these! All the stamps I own, and not one ice cream cone! After coloring it, I added stardust stickles to the ice cream. The Shock Pink is close in color to SU's Pixie Pink and matched well with their Sweet Always dp. I ran the pink paper through the swirls cuttlebug folder. The sentiment was punched with SU's new scallop oval punch, which will be available on April 1st in their Occasions Mini catalog. I also used their eyelet border punch. The chocolate chip corduroy button was threaded with some pink floss. Pretty easy card, except it took me two days to decide on a layout, which I'm not totally thrilled with. 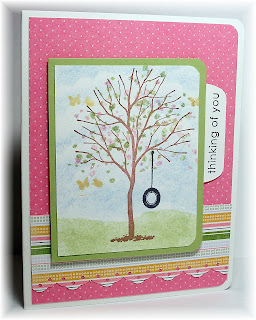 I think the polka dot dp needs to be layered on a piece of cardstock...it just looks lost there to me! LOL! Oh well, it is what it is! 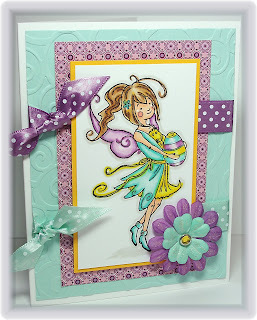 Thanks for stopping by and please drop in on the Copic Colour Challenge blog to see the awesome cards the ladies on the DT have come up with for this color scheme. I hope you can play along! I'd love to see your creations! Presale at Paper Makeup Stamps! Hi everyone! 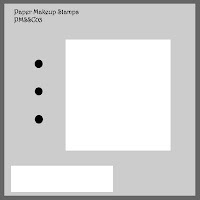 Paper Makeup Stamps (PMS) is having another release on April 7th and from now until March 30th, you can preorder your stamps and take 10% off automatically! Some stamps are priced as low as $1.80! You can't beat that! Hop on over and see what Katie has in store for you! You won't be disappointed! On another note, I attended the copic certification class held here in Buffalo today. Some of the attendees were Cheryl Rowley, Tracy Harp, and Sharon from Buffalo Stamps & Stuff. Marianne Walker taught the class, and I learned a few more things about these markers. So be on the lookout for more copic-colored cards from me! Hi everyone! Boy, have I been busy this week! I see I haven't posted since Wednesday! I missed my beloved Inspiration Challenge yesterday! I did do a card quickly, but it was unpostable (is that a word?)! I did not like the way it looked and it photographed even more miserably, so I let it go! I met with Tracy Harp and two other girls, Lynn and Beth, yesterday morning to discuss the second annual WNY Stamping Event Tracy is hosting in April. Last year she co-hosted it with Holly McMillen (Toy), but Holly has since moved to Colorado, so Tracy is hosting solo this year. Lynn, Beth, and I offered our help, and we met to discuss various things about the event. Cheryl Rowley and I are doing a copic marker tutorial since by then she and I will be certified copic marker instructors! Our class is tomorrow...it should be fun! Anyway, I also had my card club meet Thursday night and I wanted to share three of the four cards we did. (I already posted the fourth one here.) 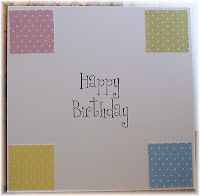 This card uses the Sale-a-bration set Polka Dot Punches as well as the Delicate Dots dp from that catalog. I used a Lauren Meader sketch for it and was sort of going for a monochromatic look. The next next one uses Branch Out, one of my favorites in the current SU catalog. I love all the extra stamps that come with it like a bird house to hang from the tree, a pair of gardening boots, a bird, butterflies, and the tire swing. I chose to hang the tire swing from the tree and have the butterflies fluttering about. I stamped them in saffron but had my girls stamp them in blue...they just showed up better. We used a post-it note to mask the top of the card and sponged celery ink on the bottom for the grass. We then used a scallop oval piece and sponged in the clouds and sky. The dp is Sweet Always and Tea party. 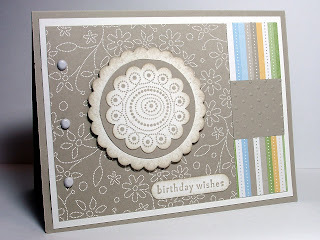 The new scallop border punch was used on the vertical Tea Party piece. We used the key tag punch for the sentiment and the corner rounder for the corners. We finished it off with diamond stickles on the tree for SPARKLE (which is difficult to see here)! For our final card, we used Friends 24/7. I love the damask stamp in this set and had them make their own dp with Baja Breeze ink. They were just thrilled to learn this technique. The stamp-a-ma-jig was an integral part of this technique, as everything had to be aligned just so. 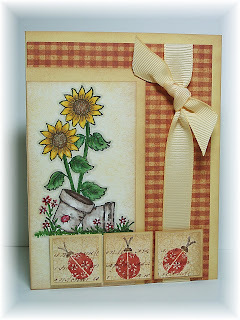 I did this technique on this card with an Inkadinkadoo damask stamp before I had this SU set. Love the look! The bird was also stamped in Baja Breeze, then a baby wipe was used to remove the ink from the branch and leaves. Close to cocoa and celery markers were then used to color in those parts. Easy peasy! I also showed them how to make this formal bow. Again, they thought it was some difficult process, but sooo easy! I love this card! There is a big ol' shadow under the bow...I have to get one of those light tents to take better pictures because this really bugs me! Hmmmm...my birthday is in a few weeks! Nice present, hubby! Well, that's all for today. I have to get my Copic Colour Challenge DT card done for Wednesday and get things ready for tomorrow's copic class! Have a great week and thanks for stopping by! Hi everyone! 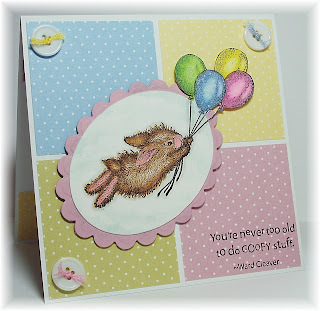 This week, we have an Inspiration Challenge on the Copic Colour Challenge blog! Chris chose this awesome painting. I know there's a name for it with the three panels, but I'm going blank right now! Here's the inspiration painting. Can you see all the possibilities with this one? I still have another technique I want to try with this inspiration, but it may have to wait until later. This is my interpretation of this piece. I am so hooked on these fairies from Paper Makeup Stamps, it's not funny! Now I know how my friend, Cheryl, got hooked on the Tildas! LOL! These are just a blast to color! This fairy dancing in the rain is Emma. 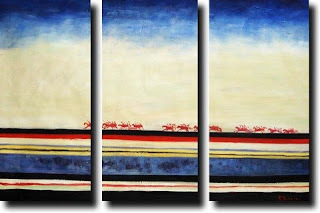 When I saw the inspiration piece, I immediately saw the great colors...red, blue, beige and light yellow. I started with that and colored my image. This image was done a long time ago when we were first given a look at this painting, and I had chosen my dp, Boxer from Basic Grey at that time as well. (This image was stamped on PTI white. I later noticed the dp was printed on cream! So I just sponged some Creamy Caramel ink over the top to tone it down so it matched better.) I just yesterday put it all together, because I wasn't sure what I was going to do from there. I thought that the other interesting thing about this painting were the panels, of course. So, I cut three pieces of the dp to mimic the panels, but had to mount them in the opposite direction to accommodate my image. I wanted a big flower, but with a little more interest. I have been seeing people using jewelry-making pieces on their cards and picked up this silver thing...I don't know what it's for, but I thought I could put something in it. This glitter dot fit perfectly and I layered it onto two primas. The sentiment that goes along with this image is also from PMS called Dance in the Rain. (The nice thing about the sentiments from PMS is that they come in a small and large size. Love that!) I couldn't fit it on the front, so it had to go inside, but I found this Embrace Happiness sentiment from PTI's Mixed Messages. I liked the two paired together. Here's the inside of the card as well as a closeup of the flower. I should have glittered up the flower, too! Whew! Long post...sorry about that! I was never good at summarzing a story! Well, that's it folks! 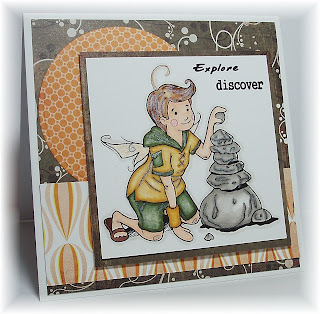 Please stop by the Copic Colour Challenge blog and play along! You have all week to enter your inspiration creations! Thanks for stopping by! I'm just lovin' this set! This card took me about 30 minutes to make, photograph, and load onto my blog! Unusual for me because the images I've been using lately have all had to be colored in detail! I chose the Mojo Monday #78 sketch for this one today and flipped it on its side. Such an interesting sketch. I've never done an edge like this before, although I've seen them and wanted to try. No excuses once it's posted on a sketch! I just used my Marvy scalloped circle punch (the purple one) and threaded the paper through so that just the end would be punched. See this post here by my friend LeAnne. 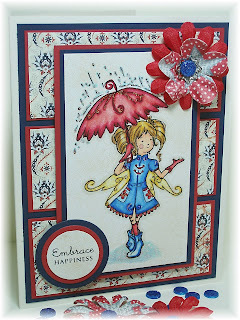 She did a fantastic tutorial on how to do this and made a fabulous card with this sketch. I started with the dp called Flock Together that matches this set. The colors that coordinate are So Saffron, Tempting Turquoise and Garden Green. I stamped the branch in green, the flowers in turquoise, and the specks around the flowers in saffron. The bird was stamped in turquoise, but I off-loaded some color before I stamped it on the branch (it's called second generation stamping). I used my good ol' stamp-a-ma-jig to line everything up just right. The sentiment was stamped in green. I added diamond stickles to the flowers and the plume of feathers on the bird. The saffron piece was run through the Birds and Swirls cuttlebug folder. I moved the ribbon over a bit to cover the seam where the saffron and dp meet. It just looked better to me. 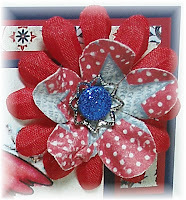 That ribbon is still available until the end of the month for the Sale-a-bration promotion! I just love it and have about four rolls of it! That's it! Wasn't that easy? And I really like these colors together! Remember tomorrow is Copic Colour Challenge time! 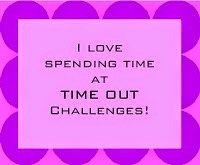 Make sure you stop by there to see what the challenge for the week is and the DT inspiration cards! Thanks for stopping by! Hi everyone! Well I'm exhilarated, exhausted, and still on cloud nine from yesterday! What a crazy day! 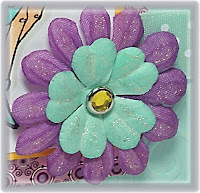 It was my first blog hop and party and things were moving fast in the PMS forum, but I had fun! I was even more excited when Katie put this image up on the Paper Makeup Store as a digi image for sale just for yesterday (sorry, you are going to have to wait for the April release date to get this again). She actually had two digi images yesterday. This one is the first boy fairy called Jack Fairy. She also had a girl called Birthday Lauren. I'll have a card featuring that image soon. This card encompasses two challenges. The first is Challenge #2 from yesterday's party which was to use the colors white, green and orange (St. Patty's Day colors). The second challenge is the sketch from Taylored Expressions. She has some awesome sketches and I like to play whenever I can. Jack is colored with copic markers. His top was supposed to be more orangey, but looks more like a maize color. I tried to match up the colors in the orange Offbeat dp from Basic Grey. The dark green dp is also Basic Grey's Wassail. I searched for the perfect sentiment and came up with these two which I think work nicely. They are stamps from JustRite. They had a sale on them a while back for a $1. There are eight little stamps in a container and are pre-inked! I bought them all, I think! You just never know when they'll come in handy (like now), and were so worth it! I think little boys are always exploring and discovering new things and new ways to do things (like building a tower of rocks!). I added some Twinkling H2O's called Icicles to his wings, and parts of the rocks, his clothing and hair. That's it! Thanks for stopping by and for all the nice comments you've left for me this weekend! I do appreciate them and love to hear from you! Have a great week! I'm just bursting with good news this weekend! If you read the post below this, you would have known that there was a Paper Makeup Stamps (PMS) blog hop today and a party. A few weeks ago, Katie, the owner of PMS, put out a design team call. Well, I applied and was accepted! It was announced today. (You can see the announcement on the PMS blog.) She kept the DT in the dark until earlier today, too! I was on pins and needles because I really wanted this! 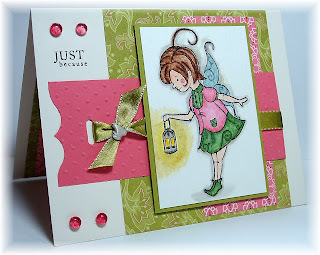 Her fairy stamps really hit home with me! Totally a style I could work with. I just love them! They come in bare rubber and on EZ-Mount and are fabulous stamps. They stamp beautifully! She even has some digi sneak peeks that are only available today, so if you want some great stamps for only $3.00 head on over to Paper Makeup Stamps today quickly! So be on the lookout for some fabulous new cards from me using these stamps! 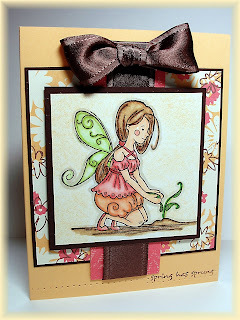 Thanks so much for stopping by and don't forget to see my card below for today using one of the PMS fairies! No, not that kind of PMS...it's Paper Makeup Stamps! (I always giggle when I see PMS!) 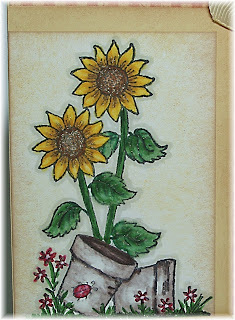 Paper Makeup Stamps is having a blog hop today. The hop begins at 12:00 noon today and the fun begins at 3:00 on the PMS forum on Paper Craft Planet (there will be some pre-party chatter there as well). If you go to Katie's blog, you can see the party plans she has cooked up for us. Now, on to my card! I've been coloring these fairies only with copic markers, so I thought I'd give them the watercolor treatment (I think I like my copics better, LOL!). I used the reinkers and a blender pen. I just can't use an aqua painter because I don't have good control over the water on the brush! I've tried and tried to no avail! So I used the blender pen. More user friendly, but not wet enough! I guess there's no pleasing me! Anyway...here is Jaina Fairy. I think it came out ok, but I think the copics would have been better. 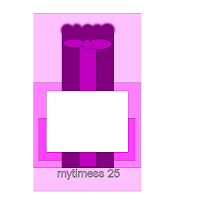 The layout is a Lauren Meader My Time sketch. As you can see, I turned the sketch to accommodate my image, which by the way is way cute! Love these fairies! After coloring my image and mounting it on Kiwi Kiss, I used Shimmerz paints in sunflower, celery, pink and sky blue for some SHIMMER! The glow around the lantern looks like I spilled something and tried to clean it up! It doesn't look like that IRL! I almost re-did the image, but it was too late! 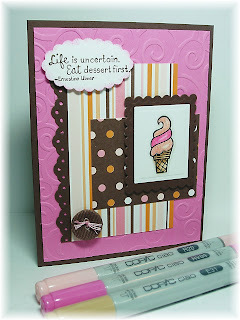 I used SU's Raspberry Tart and cameo coral which was run through the swiss dots cuttlebug folder. 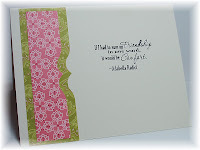 I used a Martha Stewart punch (ETA: it's called the Flourish Edge punch...I got it at my LSS a while ago, but here is a link to what it looks like. Scroll down a bit to see it.) on the end to give it some interest. The ribbon is Kiwi Kiss satin and I use a slot punch to run the ribbon through the coral piece. Dew drops and a sentiment from PTI's Mixed Messages finishes it off. On the inside, I used the same dp and MS punch and the Friendship is Comfort sentiment that I just loved! I can think of a good friend that I may send this to (I'll keep it a secret in case she's peeking in here!). Have fun and please leave these ladies some nice comments...I know they've been working hard to get their cards done and posts ready! See you later! Hello everyone! It's a beautiful sunny day here in Buffalo, NY (finally!) 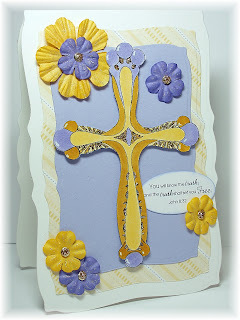 and I thought I'd do a spring-colored card today to celebrate that! The Inspiration Challenge on SCS today was an easy one for me. 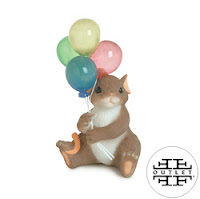 The website Stef chose today was Fitz and Floyd, which feature collectibles of all kinds, especially rabbits. I remembered this image that my friend, Cheryl Rowley, gave me when we first met for coffee. She gave me some images that she had used on her cards that I had commented on in her gallery. She even cut this one out for me! How nice...thanks, Cheryl! Well, it was the perfect image for this little guy that I used as my inspiration. Perfect, huh? I had this pad of dp from PTI called Bitty Dot Basics sitting on my table unopened and decided to go with the papers that matched the balloons. I made a 5.25" square card, and cut the dp in 2.5" pieces. This size gave me a nice white border around each one. The bunny, called Happy Hopper from House Mouse, was colored with copic markers (I have them listed in the Recipe below) and layered with PTI's Lavender Moon which was cut and embossed with a scalloped oval nestie. I painted some Shimmerz paint on each of the balloons and on the pink parts of the bunny for some SHINE! The white buttons are SU and I threaded some floss through each one. I struggled with the sentiment...should I go cute, serious, goofy? You can see I went with goofy! It's from SU's Smarty Pants set. 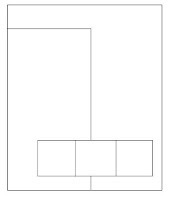 On the inside, I sort of replicated the square them by punching 1" squares from each of the dp papers. Simple, but cute card. Friday the 13th...My Lucky Day! You know how Friday the 13th is supposed to be an unlucky day? Well, not for me! Look at the surprise I had waiting for me when I got home from work today! Just click here! I'll give you a minute to look, but then come back here! OK, so can you believe it? I got home late from work today and saw Katie's email asking if she could feature my cards on her Friday Feature blog post. Are you kidding me? I emailed back a resounding ABSOLUTELY! Last week she featured none other than the amazing Lauren Meader! I'm so tickled! If you've visited my blog before, you know how much I love these fairies! They are so cute and fun to color! Well, thanks for letting me gush...things like this don't happen too often to little ol' me, especially on Friday the 13th! Thanks for stopping by and I hope your Friday the 13th was as good as mine! Are you ready for another Copics Colour Challenge? 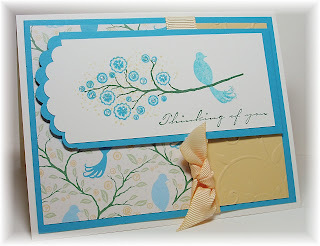 This week we have a great color combo chosen by our DT member Karen. She chose BG13-Mint Green, Y08-Acid Yellow, and V06-Lavender. Great choice, Karen! When I went to my color chart, I realized I didn't have BG13...so I called my LSS, Buffalo Stamps & Stuff, and they came through for me with the last BG13! Thanks, Sharon! When I put these colors together on paper, they matched really well with PTI's Aqua Mist and Plum Pudding. I used SU's Summer Sun for my mat on the image. Speaking of the image, isn't she just the cutest fairy? She's Elle from Paper Makeup Stamps, a fairly new company. There are eight fairies so far in her line and I have them all, that's how much I'm loving them! You can see them used on cards here and here on my blog. Elle looks like she is ready for Easter! When I saw these colors, I knew Elle would be the perfect choice! I used several copics in addition to the Challenge colors to get all the shading just right. They are all posted in the Recipe below. The dp is PTI's from the Guidelines collection. I ran the Aqua Mist layer through the D'vine Swirl cuttlebug folder. It had the same sort of whimsical feel to it as the image had. 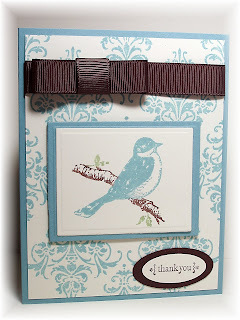 I also used PTI's satin swiss dot ribbon in Aqua Mist and Plum Pudding. 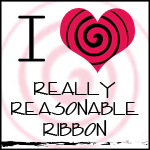 If you have never purchased this ribbon, I'd say get it! It's fabulous and is so soft to the touch! So worth the price, too! The flowers started out white. I didn't have flowers that matched, so I colored the flowers with BG10 and V06 copic markers. That is what is so fabulous about these markers...you can color virtually anything with them to match your project. I saw Linda Duke from Linda's Works of Heart color a piece of ribbon in seconds recently! So this means I need more white flowers! I added shimmer to Elle and the flower with Sakura's Clear Star gelly roll pen. Here's a closeup of the flower so you can see how this pen really shimmers and how well the flower took the color! Well, that's it for me today. Please stop by the Copics Colour Challenge blog and play this week. To play, all you have to do is enter a card on the Copics Colour Challenge blog using these colors (BG13, Y08, and V06). If you don't have all of them, use what you have, but you must use copics! Thanks for stopping by and I can't wait to see what you create! I made this card for the Mojo Monday sketch challenge this week. I had this fairy, Sprout, from Paper Makeup Stamps (a newer stamp company on the block) already colored and waiting to jump onto this sketch! Isn't she pretty? I love these stamps! This is a new one in the collection of eight fairies so far. Sprout is colored with various copic markers, which I have listed in the Recipe below. I pulled out this retired SU dp called Linen Prints because it had these earthy tones and I used those colors to color the image. She has shimmer all over her from a Sakura Clear Star gelly roll pen. Fairies should be shimmery, right? The ribbon is retired (sigh) SU satin chocolate chip. I hope they bring this back in the next catalog. It's so lucious! The base of the card is Apricot Appeal and the layer under the ribbon is also Linen Prints in a Cameo Coral color. I pierced the paper at the bottom to the sentiment (stamped in Chocolate Chip) from Spring Has Sprung by Whipper Snapper. I had never even opened this set much less used it! I must have purchased it last year around Easter and never got around to using it. Cute set. Well, that's about it. I have another post below, so be sure to scroll down and thanks for stopping by! Enjoy the rest of your weekend! Another Inspiration Challenge on SCS today...one of my favs! This week, Stef chose a website called Spunky Sprout which has some great products for kids from bedding to wall art. I got my inspiration from one of the fabulous, funky wall art pictures. Here's the one I chose called Woods Turtle Print. I knew I had a turtle in PTI's Pond Life (which I had never used), but I had to find something for those leafy things. I found this one in SU's retired Touch of Nature. It was the closest I could find. I stamped them in Really Rust and Green Galore. The turtle was stamped in Close to Cocoa, then overstamped in Really Rust. His body was cut out and placed on dimensionals. The main image is mounted on Really Rust. I found these great colors in this dp from DCWV's Animal Crackers. Such a fun pack of papers! The sentiment is from PTI's Pond Life Sentiments and was stamped in Chocolate Chip then punched with the key tag punch. I punched another in Really Rust and layered them together. The brads are from American Crafts. I did use the Clear Star Sakura gelly roll pen to the body of the turtle and the leaves for some shimmer. That's it! Another great inspiration! Thanks for stopping by...have a great weekend! And here's my card: I had to pull out my drawer of unused stamps for this one! This is an oldie but a goodie from Great Impressions that I got eons ago! I don't think I ever used it because I never knew how to color it! Well, let me tell you how much fun I had coloring it now! I actually colored it twice...the first time on white paper for a "practice" run and then on cream for the "real" one. And guess what? I liked the "practice" one better! But, it was on white and it didn't look good with the dp choice! So, look for it another time as I will be recycling it! I used various copic markers (see the list in the Recipe below) to color the image. Since I LOVE sparkle and shine, I added some using a Sakura gelly roll pen in Clear Star. I shines so nicely when the light hits it. Here's a close-up of the image. The dp is a fabulous design from Graphic 45 called Botanicabella. 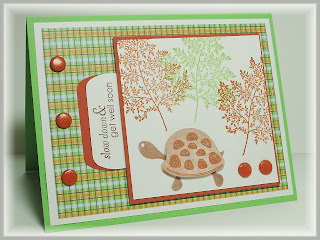 These colors are so me and "spoke" to me when I saw them in my LSS, Buffalo Stamps & Stuff! They are so rich and beautiful! The ladybugs are also stamped on some paper from the same line. The ladybugs are from the Inkadinkadoo clear set called Patterened Bugs. I chose them because there's a little ladybug on one of the pots in the image. The paper and grosgrain ribbon (from SU's Sale-a-bration catalog...I HAVE to get more because it's so gorgeous!) are So Saffron. I also sponged around the image with So Saffron and Creamy Caramel inks. Well, that's all folks! Thanks for letting me gush! I do appreciate it! Don't forget to hop over to the Copics Colour Challenge and see what the other girls have come up with...some pretty cool cards! I hope to see your creations over there too! You have all week to upload you card to Mr. Linky and you could win a prize, too! Anyone can play (even if you don't use/own copic markers), but you can only win a prize if you use copic markers. Hope to see you there and thanks for stopping by today!